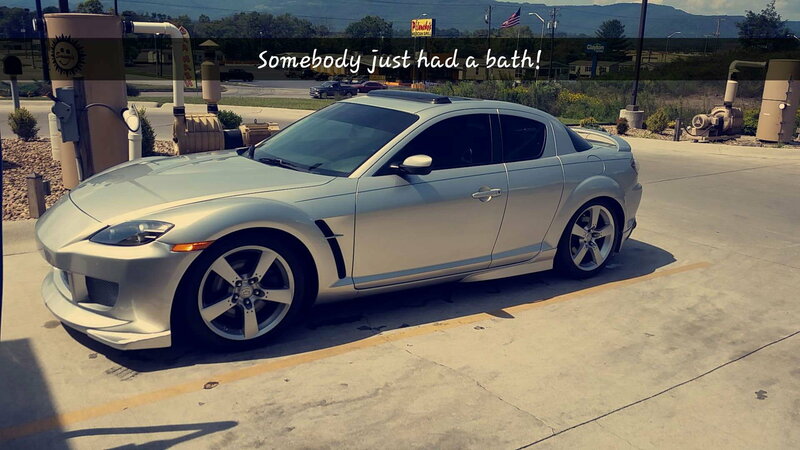 So, I bought my 05 RX8 6spd with 85k from an auto auction for well below KBB value. As a matter of fact I was kinda joking when I bid on it but hey, I got it. Lol. The first drive scared the daylights out of me as it would not stay running if i took my foot off the gas. After a little research and noticing that the clock was wrong I determined that the battery had recently been disconnected and the ecu was still learning fuel trims. This has been my dream car since I was 12 years old and Im so excited to finally have it. That being said, I promised myself Id only keep it until I graduate undergrad in 2 years at which point Ill have to buy something more economical for law school. So, Im gonna enjoy the 2 years I have with her. As of right now, the previous owner (only 2 owners before me) installed the mazdaspeed catback, k&n cai, and I think an aftermarket clutch of some kind. The ABS and TCS lights are on and according to diagnostics the front right speed sensor is faulty, but other than that this car is flawless (except for the big crack i put in the front bumper cover the first time i drove it.). So, I have a couple questions. First of all, what is the best way to check the vehicle maintenance history (engine replacements, warranty stuff, etc.)? Also, where can I find a good front bumper cover for it? Thanks in advance guys! Contact Mazda with the vin number to see if the engine was replaced under Mazda warranty. If the previous owner has any service records get those. If the service was done at a Mazda dealer, those service records can be pulled up from their computer as they are stored with Mazda. Any used RX8 needs a rotary engine compression test to know the true health of your engine going forward. This is the most important thing for you to have done right away. We can give you advice on aftermarket stuff, but the engine compression test is paramount or else your "steal" of a price may turn into an expensive undertaking if your engine is failing. This car will take more care than a normal piston engine car, so I hope you are emotionally and financially ready for RX8 ownership. Last edited by gwilliams6; 09-06-2015 at 11:07 PM.